Bay factor:This parameter still lags behind time schedule according to me. 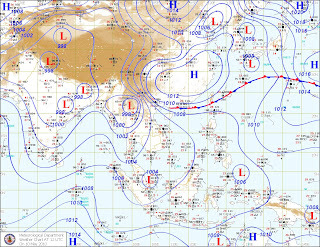 As stated, the first South-West Monsoon rains normally hit the South Andaman Sea on 12th.May. And proceed to the Middle Andamans by the 15th. By the 20th. it has covered the Islands totally. Today, is the 11th, and I do not see the Monsoon current even in the feeble stage anywhere near the South Seas. Though the South-West winds have geared up, and the moisture inflow has picked up in the region,since the last 2 days. The latest winds in the Bay continues to show strong winds rushing Northwards along the East coast of India, and re-curving into a Westerly flow of winds at the Myanmar coast. The pre-Monsoon low has also eluded the region this year.SST in the Bay is now very conducive to host a low anytime, but in the South Andaman Seas. According to ECMWF forecasts, and other models,no low is predicted in the Bay till the 18th.May at least. See Winds flow map here. The cross equatorial flow,off the African Coast, in the Western Indian Ocean, a bit "disrupted" previously,now has re-formed itself fast, and is very strong off the African Coast South of the Equator.The Somali Current ,is defined,and blowing strong ! The Mascarene highs are established, are are now "pushing" the South-Easterlies from below the Equator. The previously weak factor,the equatorial cross flow South of the Bay, is getting stronger,though slowly. However, I feel, a good booster required for the Bay branch of the Monsoon, is still wanting,and is at least a week away. With the heat factor a bit less last week in the Northern regions,the Seasonal Low in the Thar Desert is now somewhat "steady", with a core pressure at 998mb, and spread more eastwards, rather than west, due to the pulling by the recent W.D. A North-South trough indicates the line of wind dis-continuity is constant in the Peninsula region.This is a pre monsoon formation, and is a fore-runner for the seasonal low to stretch its presence over central India. 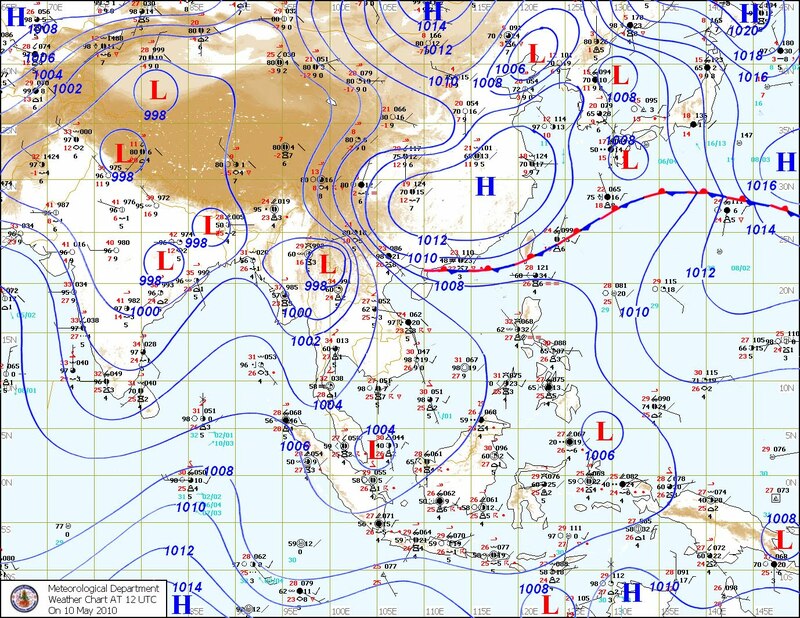 (See Thai Met Dept Map). As mentioned in my MW prevoiusly, the creation of a good gradiant between Kerala pressure and Rajasthan/Sindh pressure is absolutely a requirment. And that is a must for creating a pull Northwards for the Monsoon. Overall position in this parameter is stagnant to a bit weaker since MW 5. The 200 hpa jet stream.Normally, they should be Easterlies right upto 20N by May end. This would facilitate the Northward movement of the Monsoon Current. Today, the jet stream is developed upto the Equator, but is stationary.These 200 hpa jets winds need to come upto 8N by 15th.of May at least, and then move upto 10N before 20th.May,to be in time for the Andaman Sea Monsoon arrival.But forecasting maps are slow to show this,and indicate a slow movement Northwards,more so in the Eastern (Bay) sector. The weather-altering El Nino condition in the Pacific Ocean seems to be easing and could be over by June. That’s Nature's cyclical pattern. If conditions do revert to neutral, it could ease forecasting the quantum of this summer's Monsoon rains in India,since El Nino years tend to form fewer depressions and systems than normal from the Bay . Most computer models predict neutral conditions through the end of the year, but a few suggest the possibility of a La Nina developing, according to the Centers, part of the National Oceanic and Atmospheric Administration. According to the Climate prediction Center/Ncep, a transition to ENSO-neutral conditions is expected by June 2010, which will continue into the Northern Hemisphere summer 2010. Most other models predict a transition to ENSO-neutral conditions during April-June 2010, followed by ENSO-neutral conditions through the end of the year. El Niño weather pattern which may be relied upon to decrease the number of depressions from the Bay, has faded away like Gen. MacArthur's old soldier. As a result, the Monsoon rains quantum for the month of June could be "soakingly" encouraging (whew!). Conclusion: There continues to be a doubt on the timely arrival of the Monsoon in the Bay branch. 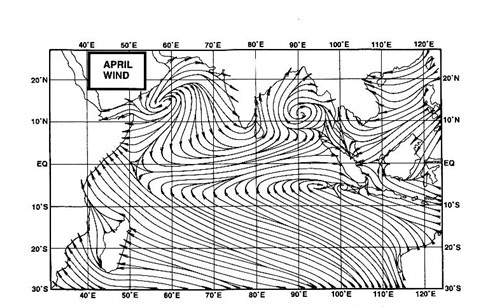 The Arabian Sea branch, shows an upper air circulation ,91A, in the South Central Sea. This, as a "proxy" for an active MJO, should initiate a momentum for the Arabian Sea branch of the Monsoon in the next 8 days. Arrival date should be around 20th. May for Maldives, 23rd.May for Sri Lanka, 1st. June for Kerala. (This Monsoon chase is my personal view, and my personal analysis and deciphering is done as per my assumptions). can u ellaborate on this report? My assumptions are that the Monsoon will reach kerala by around 1 June. Then things going normal, it should reach Mumbai by 9 June.But we will see and observe the developments and progress in the MW frequently. The Times report seems a bit generalised.